Just yesterday the Air Force received its first production model F-35 Lightinng II Joint Strike Fighter to fly in a non-testing role. This move marks the beginning of the large scale recapitalization of the United States' tactical fighter fleet with stealth aircraft (if all goes according to plan, anyway). Yes, the program is still not free of its fiscal issues and has its share of doubters, but still, the Pentagon is all in on the F-35. The first Lockheed Martin production model F-35 Lightning II to be assigned to the 33rd Fighter Wing arrived here today at 1:18 p.m. CDT after its more than 90-minute flight from Fort Worth, Texas. The aircraft, known as AF-9, will be used for activities in concert with training F-35 pilots and maintainers who begin coursework at the base's new F-35 Integrated Training Center this fall. AF-9 is a conventional takeoff and landing (CTOL) version of the 5th generation stealth fighter. 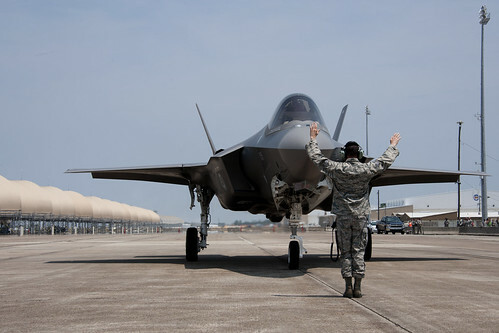 Overall, the jet is the third production-model F-35 delivered to the U.S. Air Force, with the first two assigned to Edwards AFB, Calif.
AF-9 is the first aircraft delivered from Low Rate Initial Production lot two and the seventh F-35 delivered in program history to the Air Force. Over the lifetime of the program, a total of 59 F-35s will compose the fighter fleet at Eglin AFB.